This Oak Leaf Boutique Mirror is highlighted with its whole chrome finish. The decent look perfectly matches your modern bathroom or bedroom, makes an incredible statement on any counter or vanity table. And the durable material is something you can hardly break, a mirror for dozens of years of use. 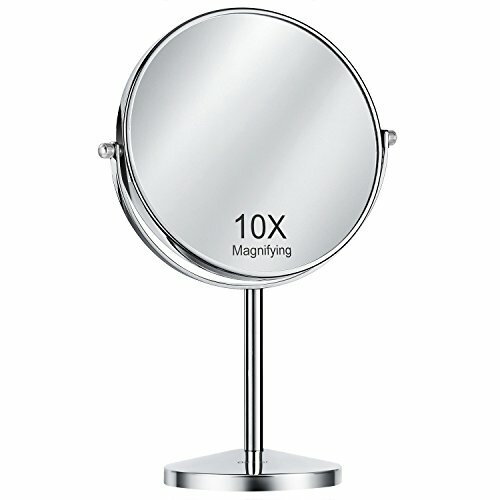 The adjustable mirror and 10x Magnification enables great convenience for you to look into details to make things right. Now you don't have to turn your head left and right again and again to fix something. Just a move of the mirror, it will serve you full hearted. Note: One screw was already tightened onto the mirror frame while another screw was tightened into one hole of the metal pole. Also, the package comes with 1 spare screw which is packed with the screwdriver. 1. Unscrewed the screw from the metal pole. 2. Put the plastic pad to match the metal base, then put the screw through the hole of the base and fix it with your thumb. 3. Put the metal pole on the screw and tighten it by clockwise. 4. Put another hole of the metal pole on the screw of the mirror frame and tighten it by anticlockwise. 5. Put the washer to match the base. 1X & 10X MAGNIFICATION: The Oak Leaf Makeup Mirror provides 10x magnification option to display a clean reflection and to make sure every detail of your hair and makeup in place, and 1x magnification to view your overall look. Smooth 360-degree swivel design makes it flexible. PERFECT SIZE TO SAVE SPACE: This Oak Leaf Makeup Vanity Mirror is only 8 inches (frame: 9 inches) in diameter and 14.7 inches in height, and the base measures 5 inches in diameter, space-saving so that you have more space for cosmetics. LONG LASTING DURABILITY: Chrome finish protects against moisture and condensation. Long lasting durability. Anti-slip design of the base prevents this Stand Up Mirror from breaking. The two screws are not packed separately, they are screwed into the both ends of the metal pole/holder. CLASSIC DESIGN: The Classic design provides an elegant decor to your room. Two-sided Vanity Mirror of this Oak Leaf Travel Makeup Mirror features a smooth swivel design. CLASSIC DESIGN: The Classic design provides an elegant decor to your room. Two-sided Vanity Mirror of this Oak Leaf Travel Makeup Mirror features a smooth swivel design. Our Customer Satisfaction Money-Back Guarantee: If you are not satisfied with the Bathroom Vanity Mirror just return it within 30 days for a full refund. No questions asked, no hassle. Scroll up to click the Add to Cart button to have your Tabletop Round Mirror shipped today. If you have any questions about this product by Oak Leaf, contact us by completing and submitting the form below. If you are looking for a specif part number, please include it with your message.